Acid mine drainage (AMD) is typically characterized by low pH and high dissolved iron. The acid mine drainage may also contain high amounts of CO2 which forms carbonic acid and further depresses the pH. The acid mine drainage waste is characterized by red water. The simplest treatment is neutralization and clarification. The ideal neutralization first combines one of the reactants with previously precipitated solids. This blend is then mixed with the other reactant. This seeding provides the opportunity for crystal growth. It also significantly reduces the reaction time. The final pH range of most neutralization reactions is 6–9. Many heavy metals precipitate as hydroxides within this pH range. However, if these heavy metal hydroxides are subjected to a pH > 11.5 for a few minutes, they convert to a crystal-like particle that clarifies, thickens, and filters more effectively than the original hydroxide. The most commonly used neutralization agent is lime. Lime is added to previously precipitated solids in a blend tank, commonly called the densification tank. 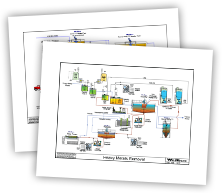 The neutralization flowsheet with this high pH feature is a high-density sludge (HDS) flowsheet. Excess CO2 dissolved in the acid mine drainage stream can be stripped out using a surface aerator. Lowering the CO2 levels can raise the pH as much as one point and lower the amount of lime required for pH adjustment. This step also begins to oxidize iron and manganese and assists in their precipitation. After stripping, the HDS slurry from the densification tank and the acid mine drainage stream are mixed in the reaction/aeration tank(s). The combination of aeration, high pH, and mixing causes the iron, manganese, and other heavy metals (if present) to precipitate to the fullest extent possible at the set pH level. Treated water flows to a thickener for sludge thickening and clarification of the water. The metal precipitates as sludge, and a portion of the sludge is recycled to the sludge densification tank. The remainder of the sludge goes to disposal. Generally, the sludge will also contain gypsum and unreacted lime, which enhance the resistance to re-acidification and metal mobilization. A gravity sand filter may be used to “polish” the stream prior to discharge, depending on permit limits. Depending on the site conditions, the thickened waste sludge may be redirected to another portion of the mine, dewatered and deposited prior to disposal in a landfill, or concentrated to paste and stacked. Since acid mine drainage comes from abandoned mines these sites are often in mountainous, uninhabited areas where access to the site may be difficult. Many systems have been built with ease of operation being paramount. In fact, the systems are often built for operation with no onsite operator. This has led to the use of caustic for neutralization. Caustic is a liquid and is much easier to feed than lime. However, it does not make the same crystals that lime does, so the precipitate is difficult to settle. Caustic-fed systems are much more liable to upsets and the precipitation tanks should be designed for longer holding times. Also, caustic is much more expensive than lime. The desire to eliminate all types of basins and ponds has prompted industry to use more refined treatment systems. Acidic streams containing iron, aluminum, and sulfate are treated for removal of these contaminants. Another driver for segregating and treating this stream is ever-decreasing mercury limits. These limits make it desirable to treat the stream prior to comingling with more conventional wastewater streams. The addition of ferric chloride neutralizes charged particles, promoting flocculation and enhancing clarifier performance. Ferric chloride also precipitates mercury and organic matter. Polymer addition yields larger flocs, further enhancing clarifier performance. The wastewater is clarified by a CONTRAFAST® Clarifier, while pH is normalized with hydrochloric acid. While the majority of waste streams generated from acid mine drainage (AMD) are characterized by low pH (2-4) and high dissolved iron (1,000 – 10,000 ppm), there are some AMD streams which are not contaminated to these extremes. These streams may have relatively high pH levels (5-7) and dissolved iron levels as low as several hundred ppm. With water sources from industrial applications, especially hydraulic fracturing (“fracking”) operations, becoming harder to obtain, these marginal quality water streams are becoming more attractive for reclaim and use as process makeup waters. Dissolved ferrous iron (Fe2+) is first oxidized to ferric iron (Fe3+), which readily forms the insoluble iron hydroxide complex Fe(OH)3. In addition to providing the oxygen required to precipitate the iron, the use of surface aerators allows CO2 to be stripped from the water. This increases the pH of the water stream as well. In the case of these relatively small flows, caustic (NaOH) is used as the sodium hydroxide source. Caustic, while having its own hazardous properties, is easier to prepare and add to the stream, involves less capital cost, and produces less sludge than the addition of lime slurry which is commonly used on large AMD flows. The caustic also increases the pH to a neutral level for further treatment and subsequent use. Polymer is added to the stream to aid in floc formation and the stream is subjected to high energy mixing either in an inline mixer or a rapid mix tank. This is done to ensure that the polymer solution is completely dispersed in the stream. The flow then enters a slow mix tank which allows the floc that is beginning to form to grow to a point where it is large enough and heavy enough to readily settle. A WesTech SuperSettler™ lamella type unit can be used for this purpose. This unit provides a large projected area in a relatively small footprint. In addition, it has no moving parts making for easy operation and low maintenance. Solids settled in the lamella section are collected in a bottom hopper. This hopper can have a thickening mechanism or rake added as an option to thicken the sludge. The SuperSettler™ is perfectly coupled with a SuperSand™ continuous backwash sand filter. This is due to the fact that the water can flow through both units without having to be repumped. The SuperSand™ unit creates its own filtered water backwash stream so there is no need for filtered water storage or backwash pumps. The unit generates a constant dirty backwash stream of approximately 3–5% of the inlet flow. If low TDS water is required for downstream processes (i.e., boiler feed), then ultrafiltration and reverse osmosis can be added to the system to produce this type of high-quality effluent. Depending on the mine site, the waste streams from each treatment step may be returned to a separate section of the mine for disposal. At installations where this is not possible due to either logistics or regulations, conventional sludge thickening and dewatering technologies may be applied. WesTech has experience in the phosphoric acid industry includes clarification, thickening, and dewatering. Calcium fluoride and calcium phosphate slurries present specific challenges. Another challenge is found in plants with hydrofluoric acid in their discharge. Hydrofluoric acid is extremely corrosive and is toxic to humans. At these plants, solids contact clarifiers have been applied instead of external reaction tanks and flocculating clarifiers. These units are designed to prolong the period of precipitation. Solids growth is enhanced by the high level of precipitated solids present during the reaction. This has resulted in denser underflow and lower fluoride levels in the effluent than laboratory predictions. The underflow is sent to a gravity thickener and then to filter presses. The waste from phosphoric acid plants usually consist of gypsum pile drainage. It is highly acidic with a pH of 1.0 to 1.8. The extremely acidic drainage requires a two stage neutralization system. Clarification occurs between stages. The first stage uses lime to capture fluoride and elevate the pH to 4.5. The second stage pH is then raised to exceed 10.5. This approach reduces fluorine levels well below the mandated levels of 25 ppm. Phosphorus levels are similarly reduced below the 35 ppm limit. Alternative single stage processes fail to reduce fluoride levels below the required maximum. Historically, calcium fluoride (CaF2) precipitation required a 60 minute reaction time. Adding previously precipitated and thickened CaP2 solids to the lime slurry improves the process. Resulting reaction time is reduced and the sludge precipitate is denser. WesTech testing suggests the recirculated solids should be three to five times the precipitated solids. Others have advocated higher recirculation rates. The reaction slurry contains most of the fluoride plus a good portion of the phosphate. This thickens to produce an underflow with up to 40% suspended solids. Effluent fluorine is now less than 40 ppm and is fed to the second stage. The underflow is discarded usually in ponds, but this practice is being reviewed by EPA. The second stage recirculates precipitated solids reducing reaction time. Solids, phosphate quantity, and settling characteristics make it impractical to recirculate solids more than once per pass. The solids are thickened to 10% suspended solids. Clarified effluent is discharged to waterways and the underflow is discarded. Second stage feed liquor and underflow contains phosphate that is essentially free of fluoride. Some of this may be recycled through the process if the plant water balance permits.